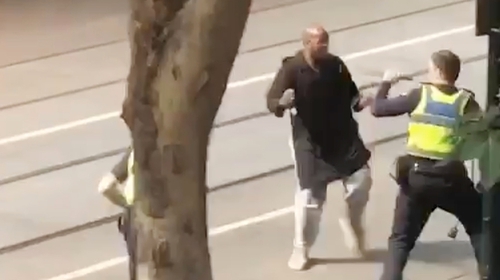 Australian police have said a Somali man who stabbed three people, killing one, in Melbourne drove a car laden with gas cylinders which caught fire. Police said they were treating the attack as terrorism. The so-called Islamic State group claimed that one of its members carried out the attack, but it provided no evidence for the claim. The attacker was shot by police and later died in hospital, Victoria Police Commissioner Graham Ashton told reporters. "We don't believe there is an ongoing threat at this stage, but certainly we are treating it as a terrorism incident," Mr Ashton said. Several bystanders and police officers were attacked by the man on central Melbourne's Bourke Street. Mobile phone footage posted on social media showed a man lunging at police officers with a knife as a car was engulfed in flames nearby. Police said gas cylinders were found in the man's vehicle, which had been set alight. Officers had initially responded to a report of a car on fire on the popular shopping street at 4.20pm local time (5.20am Irish time). Superintendent David Clayton told a press conference at the scene: "Nearby police quickly responded to the incident. As they got out of the car they were confronted by a male brandishing a knife and threatening them. "At the same time passers-by were calling out that members of the public had been stabbed. Police shot the male in the chest and he is now in a critical condition under guard at hospital. "Three people have been stabbed. Unfortunately one is deceased at the scene. Two other victims are currently in hospital." In one video posted on Twitter the man can be seen repeatedly lashing out at two officers, apparently with a knife. Two people, apparently members of the public - one with a shopping trolley - then come to the officers' aid. The suspect can then be seen falling backwards on to the ground.